The Company’s headquarters in London, from which much of India was governed, was East India House in Leadenhall Street. After occupying premises in Philpot Lane, Fenchurch Street, from 1600 to 1621; in Crosby House, Bishopsgate, from 1621 to 1638; and in Leadenhall Street from 1638 to 1648, the Company moved into Craven House, an Elizabethan mansion in Leadenhall Street. The building had become known as East India House by 1661. 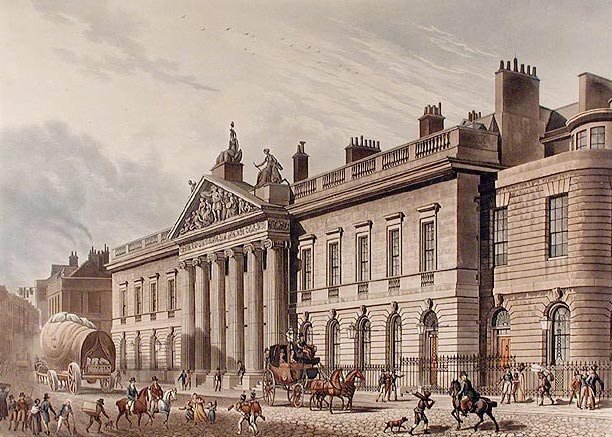 It was completely rebuilt and enlarged in 1726–9; and further significantly remodelled and expanded in 1796–1800. It was finally vacated in 1860 and demolished in 1861–62. The site is now occupied by the Lloyd’s building. As drawn by Thomas Hosmer Shepherd, c.1817. This entry was posted in Company Rule, Council Houses, Government Establishments and tagged bishopsgat thomas hosmer shepherde, British East India Company, crosby house, East India Company, east india house, fenchurch street, leadenhall street, london, philpot lane.